The 1978-79 Serie A season was remarkable in many ways. AC Milan under the able leadership of Gianni Riveria won the title after a long dry spell of eleven years. But that season is more famous for a dubious achievement. Despite going undefeated for the full season AC Perugia became Italy's first 'invincible', yet they failed to lift the title. They never got any recognition and fame. Even after so many years most of the football fans don't know about them. Maybe the reason is history doesn't remember those who come second. It took the might of AC Milan in 1991-1992 and Juventus in 2011-2012 to equal the record set by Perugia in 1978-79. 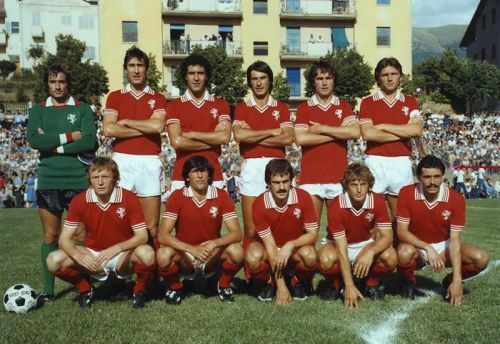 The feat was an extraordinary achievement in the sense that 1978-79 season was only their fourth season in Italy's top tier football. They played 30 games through the entire season and out of which they drew 19! These stalemates was one of the reasons why they failed to lift the Scudetto. They only conceded 16 goals in 30 games. Defensively they were superb. Their defense was so compact and dense that they conceded more than one goal only twice in the season. Although they didn't drain many goals, it was their attacking unit which let them down. They failed to score enough goals to win matches. They also achieved an unusual feat in that season. They didn't pick any card through the entire season, not even a single yellow! How tough was the fight? They managed to give a tough fight to mighty AC Milan. They kept pace with leaders all the way till the end but their performance in last few matches hampered their chances. Those 19 draws gave a heavy blow to their title hopes. They fought bravely till the end. They didn't have much resources and were a small team financially but they pulled off something extraordinary. Bravo AC Perugia.